Marjoram (Origanum majorana), also called wild oregano or sweet marjoram is an herb that is a member of the mint (Lamiaceae) family. Although closely associated with oregano, marjoram and oregano are two different herbs. Both are commonly used in Greek and Mediterranean recipes, but marjoram has a lighter, sweeter, more floral flavor than oregano. Marjoram also provides certain wellness and nutritional benefits. Consumed in large amounts marjoram can significantly boost your micronutrient intake and provide health benefits. But you are not likely to consume enough marjoram to take advantage of them. Most recipes require a tablespoon or two of the herb. That amount won't significantly change the nutritional benefits you get from your food. You should note that there is not enough evidence to support the use of marjoram for these benefits. One preliminary study indicated that marjoram oil may help improve lung function in people with asthma. However, the statistical analysis of the study has been questioned and further research is needed to understand this effect. Another study investigated that role that an essential oil containing marjoram might play in women experiencing painful periods. The oil which combined lavender, clary sage, and marjoram essential oils did help reduce the duration of menstrual pain when applied topically to the lower abdomen, but since the cream was a combination of several ingredients, it is unclear how much marjoram oil had an effect. Marjoram tea may help women with polycystic ovarian syndrome (PCOS), according to a pilot study published in the Journal of Human Nutrition and Dietetics. But study authors note that more studies are needed to fully understand the effect. When you cook with marjoram, you're likely to use the dried variety of the herb. You're also likely to use a relatively small amount. A generous 1-tablespoon serving of marjoram provides just 5 calories, according to USDA data. Most of those calories come from carbohydrate—in the form of fiber and naturally occurring sugar, but marjoram is not a significant source of carbs, sugar, or fiber. A typical 1-tablespoon serving of marjoram is also not likely to provide significant micronutrients. But you will get a small amount of vitamin K (9.3 mcg or 12 percent of your daily recommended intake). You'll also get a small boost in your intake of vitamin A, vitamin C, folate, and vitamin B6. Minerals in marjoram include calcium, iron, and manganese. Marjoram has a flavor that is often described as minty, sweet, or woodsy. Since many cooks use dried marjoram, you are likely to find this herb in the spice aisle. You can also purchase dried, bulk, marjoram online. Ground marjoram is also an option. Like all dried herbs and spices, store your marjoram in an airtight container in a cool dark space. Properly stored, it is likely to stay good for three to four years. You can also find fresh marjoram in some markets. However, many cooks say that marjoram is one of the rare herbs that tastes better dried. When adding to recipes, use one teaspoon dried marjoram for each tablespoon of fresh marjoram. Marjoram pairs well with roasted meats, tomato, and vegetable dishes. Marjoram is often used when making pizza and is often combined with other herbs in spice blends. Some people also make marjoram tea, using the dried herb, honey, and hot water. When used in typical amounts to flavor food, marjoram is likely safe for most people. It is also possibly safe when used medicinally for a short period of time. 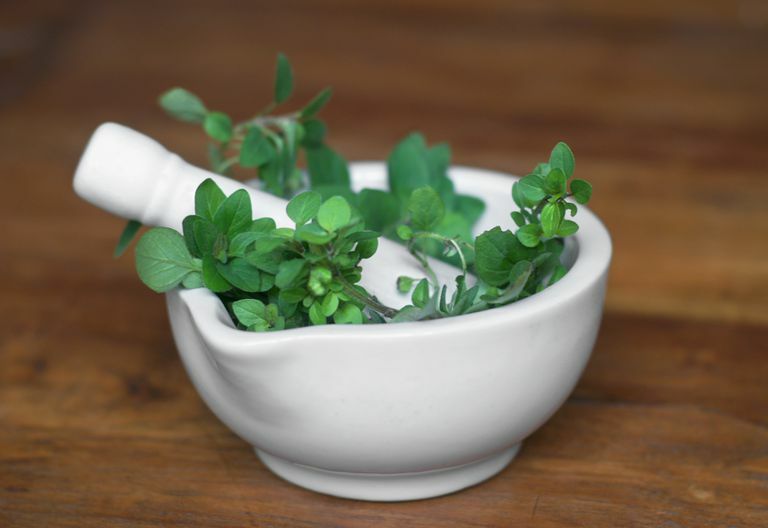 According to some sources, marjoram may be unsafe when used long-term. "There is some concern that marjoram could harm the liver and kidneys or cause cancer if used long-term." Certain people should get advice from a healthcare provider before using marjoram as medicine. These include pregnant or breastfeeding women, children, people with bleeding disorders, and those about to undergo surgery. People who have allergies to basil, hyssop, lavender, mint, oregano, and sage or any other plants in the mint family may experience an allergic reaction to marjoram. ﻿Since they are closely related, is oregano the best substitute for marjoram in recipes? The answer to this question is debated among cooks. Some say that the flavor profile is close enough that oregano can be used instead of marjoram. However, many others disagree saying that oregano is too strong. Those cooks recommend sage, thyme, summer savory, or basil. Marjoram. Full Professional Monograph. Natural Medicines Comprehensive Database. 8/16/2018. Haj-Husein, I., Tukan, S., & Alkazaleh, F. (2015). The effect of marjoram (Origanum majorana) tea on the hormonal profile of women with polycystic ovary syndrome: a randomised controlled pilot study. Journal of Human Nutrition and Dietetics, 29(1), 105–111. DOI: 10.1111/jhn.12290. Bina, F., & Rahimi, R. (2016). Sweet Marjoram: A Review of Ethnopharmacology, Phytochemistry, and Biological Activities. Journal of evidence-based complementary & alternative medicine, 22(1), 175-185. DOI: 10.1177/2156587216650793. Mohamed MS, Saad HH, and Abd El Khalek MG. Daily consumption of marjoram oil improve the health status of patients with asthma. Pakistan Journal of Nutrition. 2008;7(2):312-316. Ou, M.-C., Hsu, T.-F., Lai, A. C., Lin, Y.-T., & Lin, C.-C. (2012). Pain relief assessment by aromatic essential oil massage on outpatients with primary dysmenorrhea: A randomized, double-blind clinical trial. Journal of Obstetrics and Gynaecology Research, 38(5), 817–822. DOI: 10.1111/j.1447-0756.2011.01802.x.